I don’t seem to have many photos from October 2004 for my post of photos from ten years ago… it must have been a dry month. 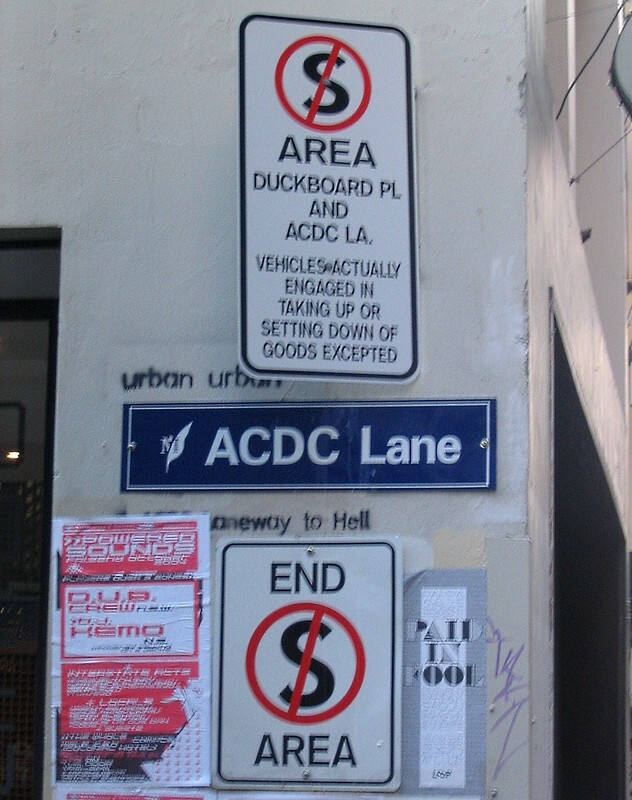 A slightly out-of-focus photo of the street sign in ACDC Lane, snapped a couple of weeks after it was renamed on October 1st 2004. It’s in the news this week because Cherry Bar, located in the lane, has started receiving noise complaints from people who have just moved into new apartments nearby… who apparently don’t really want the city ambience they probably paid top dollar for. Unfortunately the clever new “Agent of Change” laws which would require developers to pay for music venue soundproofing only apply to developments approved after the laws came into effect. 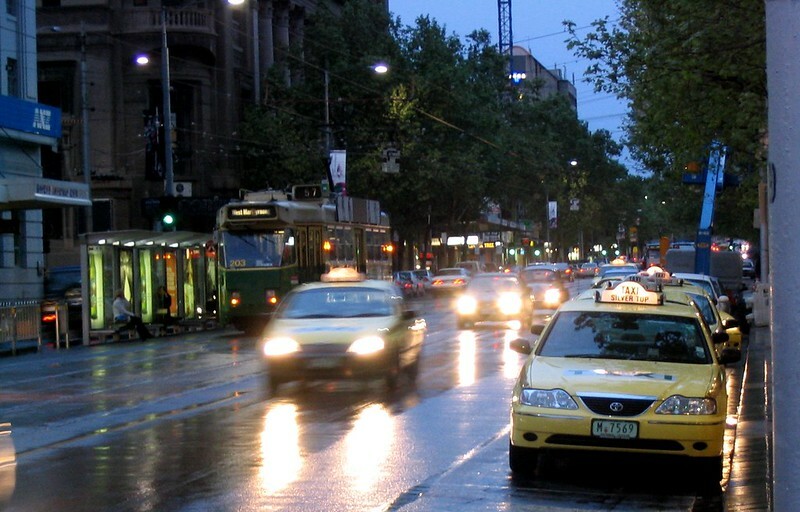 Elizabeth Street. Note no tram superstops, old tram colours, and that disused Argus building on the corner of Latrobe Street, still disused. PS. 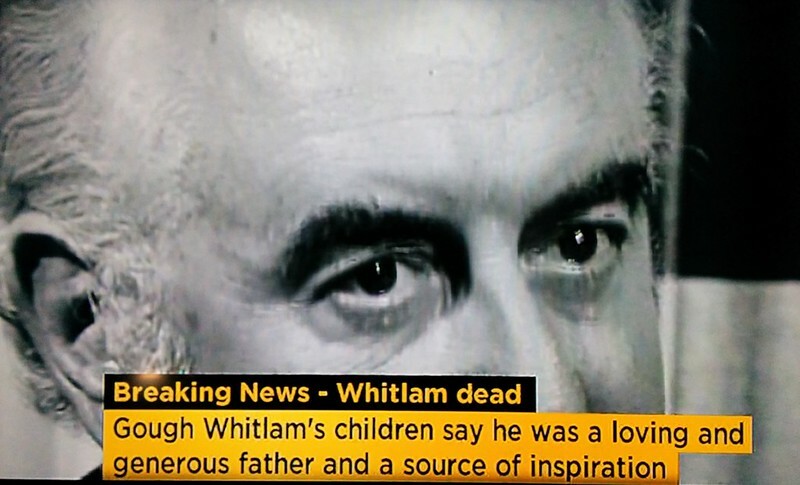 Not from ten years ago; from a few minutes ago — Breaking news: RIP Gough. Next → Next post: The Frankston line X’trapolis – are you impressed? He has been the topic all day today on 3AW. Neil Mitchel all morning, and now sounds like Dennis Walter may have his whole program on him too. It is great to reflect, and it is great to see him getting all of this respect. On the other topic, I have always said that ‘The Met’ green and gold was the best livery to ever be seen on our trams, even on the W class too what a drab grey we had to put up for way too long. On the other hand, the platform stops are a great step forward. Irony here is, in my view the one route in most need for low floor trams has to be #59 with the two Royal hospitals along its route. Hope they get E class before #86 does. The Agent of Change law is probably the best thing Matthew Guy has done in his time as Planning Minister in my opinion. Melbourne is well loved and renowned for its live music scene, and it wouldn’t survive if increased density means no live music venues can keep operating without significant expense of soundproofing (Cherry bar has managed to raise $50,000 from local punters and fund raisers, but I doubt this will cover the full expense, nor eliminate the complaints completely). Without the live music scene, you can bet that plenty of other aspects of the arts would suffer as creative people move to somewhere with a larger and more interesting scene. Is that a Hyundai taxi ?